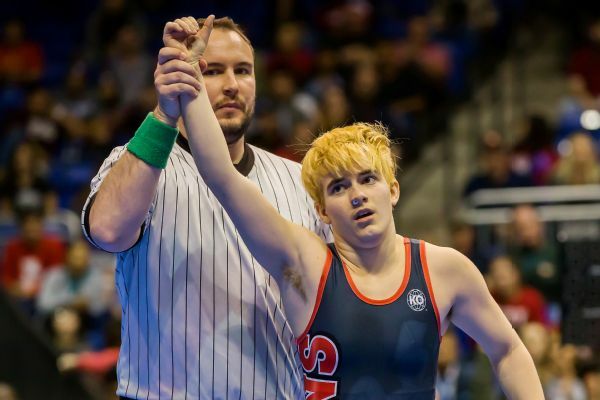 Mack Beggs, a 17-year-old transgender wrestler from Euless Trinity, finished the season 56-0 and won the Texas state girls' title in the 110-pound weight class. "I wouldn't be here today if it weren't for my teammates. That's honestly what the spotlight should be on, is my teammates," Beggs said. "The hard work that I put in the practice room with them beside me, we trained every single day, EVERY single day, and that's what the spotlight should be been on, not me. "Hard work pays off," he added, holding up his medal. Beggs, who reached the state tournament after two opponents forfeited, was dogged throughout the tournament by questions about whether his testosterone treatments made him too strong to wrestle fairly against girls. The University Interscholastic League, which oversees athletics in Texas public schools, enacted the birth certificate policy Aug. 1, 2016. And while Beggs' family has said he wanted to compete against boys, UIL deputy director Jamey Harrison, who refused to address Beggs directly, said the UIL had not received a request to change divisions from any athlete at this competition. "Nothing that has happened at this year's wrestling championships has the UIL reconsidering its rules, because quite frankly, we don't believe that any issues being reported on are really a product of UIL rules," he said. In the semifinals, the match was halted for a couple of minutes because Beggs had a bloody nose. Trainers finally managed to stop the bleeding, and the fight resumed. Not long after, Beggs slammed Clay on the mat and pinned her. He and Clay shared a long hug before an official raised Beggs' arm to signal victory, and the wrestler scurried off the mat. Clay's coaches shouted to reporters that she "did not have permission" to talk to them after her loss, and both of her parents declined to comment.